Hey! It's testgame time! So, yes. I'm sure by now all you seasoned readers are used to/tired of my worn out formula. Welcome to testgame.exe: Making the Adventure, this month's update is awesome, etc. So, yes. I’m sure by now all you seasoned readers are used to/tired of my worn out formula. Welcome to testgame.exe: Making the Adventure, this month’s update is awesome, etc. etc. This month, I’m going with a more…minimalist approach. (Conceivably due to laziness, I’m not going to lie.) Since there’s not really anything groundbreaking to report (except, oh yeah, NEW CHARACTER AND PLOT STUFF! (see below)), I’m just gonna go ahead and leave you with the game and the list of new stuff for this month. New character! Go on up to the new (as of last month) screen and you will find…HERKIMER! And speaking of the new character…. Now when you enter the above-mentioned screen, there will be a brief little cutscene between Paul and Herkimer. There’s nothing else to do afterwards (yet), but it’ll be there eventually, I promise. New animation in the castle hallway screen (the one leading to the kitchens). This is the first time I’ve tried using background animation, and I’m hoping it looks at least somewhat believable…. All the graphics and design are by Lizo. The story and dialogue were written by Lizo, with significant input by Paul. The background music is by Lizo. “Let’s Go Skateboard” is written and performed by The Word Problems. 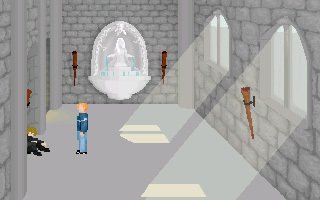 Adventure Game Studio (the program used to create this game) can be downloaded at http://www.adventuregamestudio.co.uk/. Elizabeth Medina-Gray (a.k.a. Lizo) is the creator of the game-in-progress tentatively titled "testgame" and the author of "testgame.exe: Making the Adventure." She thinks videogames are cool.